IBM researchers have successfully stored a single data bit in only 12 atoms, as currently it takes about a million atoms to store a bit on a modern hard-disk. 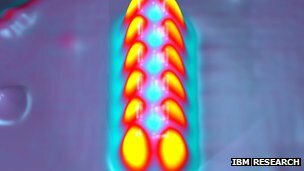 The researchers believe this is the world’s smallest magnetic memory bit. The new technique opens up the possibility of producing much denser forms of magnetic computer memory than today’s hard disk drives and solid state memory chips. “Roughly every two years hard drives become denser,” research lead author Sebastian Loth said. “The obvious question to ask is how long can we keep going. And the fundamental physical limit is the world of atoms. Below 12 atoms the researchers found that the bits randomly lost information, owing to quantum effects. A bit can have a value of 0 or 1 and is the most basic form of information in computation. The groups of atoms, which were kept at a very low temperature, were arranged using a scanning tunnelling microscope. Researchers were subsequently able to form a byte made of eight of the 12-atom bits. Central to the research has been the use of materials with different magnetic properties. The magnetic fields of bits made from conventional ferromagnetic materials can affect neighbouring bits if they are packed too closely together. “In conventional magnetic data storage the information is stored in ferromagnetic material,” said Dr. Sebastian Loth, who is now based at the Center for Free-Electron Laser Science in Germany. Other scientists thought that was an interesting result. “Current magnetic memory architectures are fundamentally limited in how small they can go,” said Dr. Will Branford, of Imperial College London. But the move from the lab to the production may be some time away. “Even though I as a scientist would totally dig having a scanning tunnelling microscope in every household, I agree it’s a very experimental tool,” Dr. Sebastian Loth said. Dr. Sebastian Loth believes that by increasing the number of atoms to between 150 to 200 the bits can be made stable at room temperature. That opens up the possibility of more practical applications. “This is now a technological challenge to find out about new manufacturing techniques,” he said.